A few days ago Tencent officially announced a major restructuring (Link in Chinese), the third ever in company history. The move is a big deal for the Chinese internet industry as the repositioning of Tencent’s divisions reveals much about their long strategy and where they believe the future key internet and technology sector battles will take place. In this essay I hope to provide a detailed breakdown and analysis of the restructuring and the implications for Tencent’s strategy moving forward. Tencent has been subject to intense criticism in media throughout 2018, new government regulation issues loom large over the lucrative gaming business and the rise in popularity of short video applications and news applications from rival Bytedance has called into question their dominance over online attention. These are undoubtedly trying times for Tencent, the bright spot being their flagship product WeChat which seems to have made a breakthrough this year with widespread adoption amongst businesses of their mini program format. – Tencent CEO Pony Ma, interview for People’s Daily. 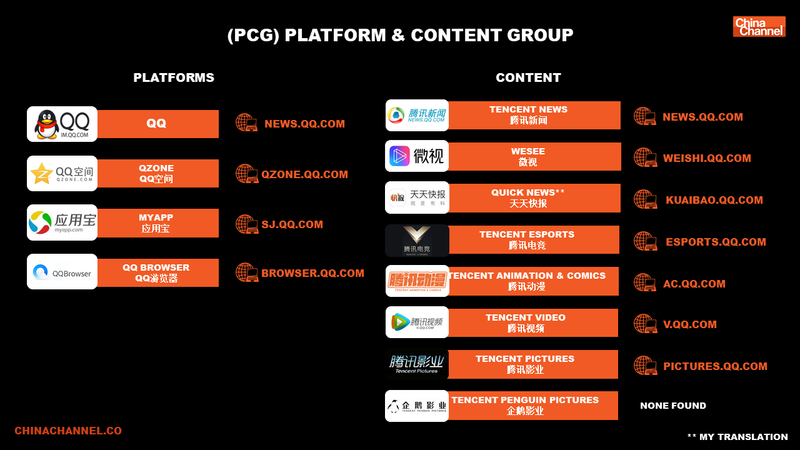 Before we delve deeply into the recently announced changes, I think it’s very useful for us to take a step back and cover a little bit of Tencent history to analyze some of the previous organizational changes made at Tencent and how they worked out. This current change marks the third major shake-up in Tencent’s history with two previous major adjustments to the organizational structure in 2005 and 2012. Tencent’s first major adjustment in 2005, was made in the pre-mobile era when they were still a relatively small company of three or four thousand people. Things had gotten to the stage where the CEO had no energy to manage every business directly, and the inefficiencies of internal coordination were rapidly rising. The company was essentially divided into independent business units with two core lines ‘Business (B Line)” and “Platform Development (R Line)”. This new situation was a great improvement from before but by the time it had come to 2010 this system was starting to cause serious issues, one of which provides us with the perfect example of how organizational structure really can have a huge impact. 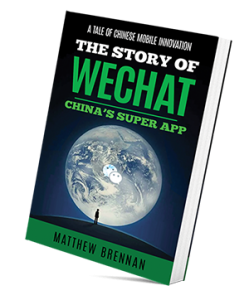 One of the key reasons why WeChat, built by a small team under the Guangzhou Research and Development unit, had the chance to rise up and take its dominant place as Tencent’s new flagship product was because of the disorganization amongst Tencent’s incumbent core messaging product QQ which had become scattered across three different departments under the old “Business Unit” system. The PC version of QQ was in the instant messaging department under the R&D line, mobile QQ and mobile QQ Zone were under the wireless department in the business line, and the web version of QQ Zone was under the Internet department under the business line. With three sectors each in charge, internal coordination has become a big problem. Division of the business units had severely slowed down the operational speed, resulting in the inability to quickly bring new features to market, the user experience was sometimes ignored, leaving QQ unable to adapt to the competition in the mobile internet era. 2010 – 2012 was a period of immense change at Tencent. The era-defining “360 QQ War” erupted around this time. 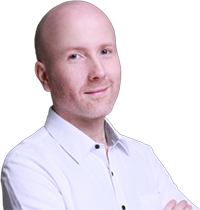 2011 was when James Mitchell joined Tencent from Goldman Sachs as Chief Strategy Officer and began fast-tracking Tencent’s expansion as an investment force. Last and by no means least the transition from PC to mobile internet had now reached China and mobile phone unit sales were being to explode. In May 2012, the organizational structure was adjusted again to establish business groups with products as the core. This adjustment along with the rise of WeChat brought back vigor to Tencent as they moved forward into a new era. The core of the new set up was built around “autonomy”, giving the heads of each business group the greatest authority in business development. Business units that can generate large amounts of revenue or have the potential for development do not need to consider the synergy between the various businesses, they only need to focus on rapid growth. Pony Ma’s intention was for this adjustment is to overcome “big company illness”. “When the size of the team grows bigger, it is easy to breed big business problems. How can we overcome the big business problem and build a world-class Internet company?” he said in an email at the time. Allan Zhang, the founder of the WeChat team is also well known to highly respects flat management and agile development. The WeChat team is said to maintain the most capable, compact and flattest team size and management structure within Tencent. As we look at things currently, however, the Tencent of today has grown considerably since the days of 2012 when the last structural change was made. Tencent reported having 44,796 employees by the end of 2017 with a total employee compensation bill of 34.8 billion RMB ($5 billion USD). Which puts the company-wide average annual compensation at 770,000 RMB ($112,000 USD) which has grown considerably in the last few years (see chart). This rose considerably in 2017 in part due to increased stock options issued to a large number of staff. 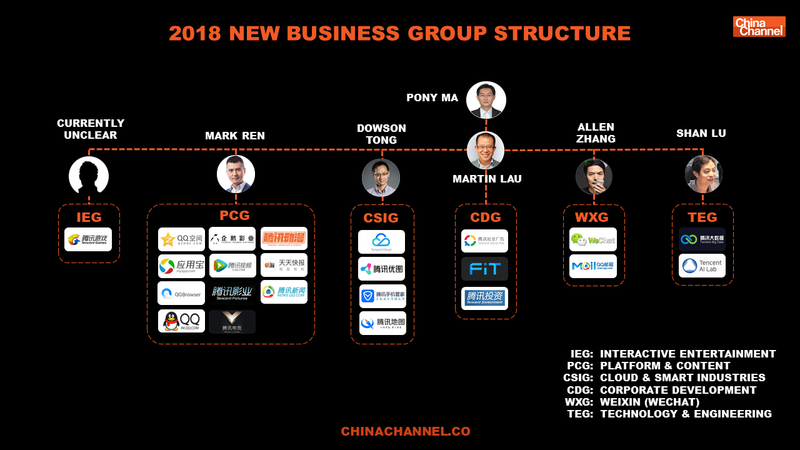 Firstly, it’s worth noting that the WeChat Group (WXG) and the Technology & Engineering Group (TEG) have basically remained untouched by the restructuring. WeChat team are mostly located in Guangzhou away from the Shenzhen head office. A new group entitled CSIG is formed. The group combines Tencent Cloud, Internet +, Smart Retail, Education, Medical, Safety & Location Based Services and industry solution plans. The group combines social platforms, traffic platforms, digital content split and reorganized from IEG, SNG and OMG. The 3 business groups of Online Media Group (OMG), Social Networking Group (SNG) and Mobile Internet Group (MIG) are now disbanded with their entire businesses split up and absorbed by the 2 new entities CSIG and PCG. Corporate Development Group (CDG) and Interactive Entertainment Group (IEG) have had some of their units moved over to the newly formed PCG and CSIG. “This initiative is a new starting point for Tencent’s next 20 years. It is a very important strategic upgrade. The second half of the internet belongs to the industrial Internet. In the first half, Tencent provided users with high-quality services by connecting people. In the second half building from this foundation, we will support industries and consumers to form more openly connected ecosystems. You will have probably noticed that the previous two quotes used to explain Tencent’s structural changes use terms that sound rather strange in English “First half / second half of the internet”. Yet this terminology is a very common way of talking about the internet industry in Chinese. The consensus in China states that the growth phases of the internet can be split into two distinct stages and we are now currently at the point of transition between these two different stages (the first half and the second half). The first half was characterized by rapid growth in consumer internet usage, firstly in desktop and later mobile. Time spent online per user increased rapidly during this stage and consumer-facing services and products led the growth whether that was in ecommerce, search, messaging, video, entertainment, gaming, O2O etc. The past few years have seen a second wave of growth in platforms and services catering to the users in lower-tier Chinese cities and rural areas which came online later than the rest of the country. The second half of the internet is one where the mobile app economy and ecosystem are very mature and growth for new services becomes increasingly difficult in this crowded and competitive environment. Instead, the strong growth potential is expected to come from collaborating directly with other businesses to digitalize their industries. To leverage many different internet technologies (AI, big data, cloud computing etc.) to bring new services and reap large-scale efficiencies. “From the management side, the biggest challenge we face is internal organization. 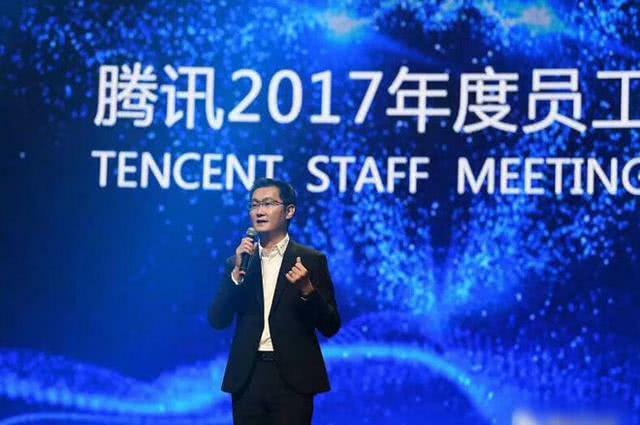 Right now Tencent needs to get better at doing B2B.” – Pony Ma, Tencent Annual Internal Staff Meeting 2017 Dec 15th. This quote is from the annual Tencent internal staff meeting last year, it shows the higher management have been aware for a considerable time that change in organizational structure and strategic focus were necessary. 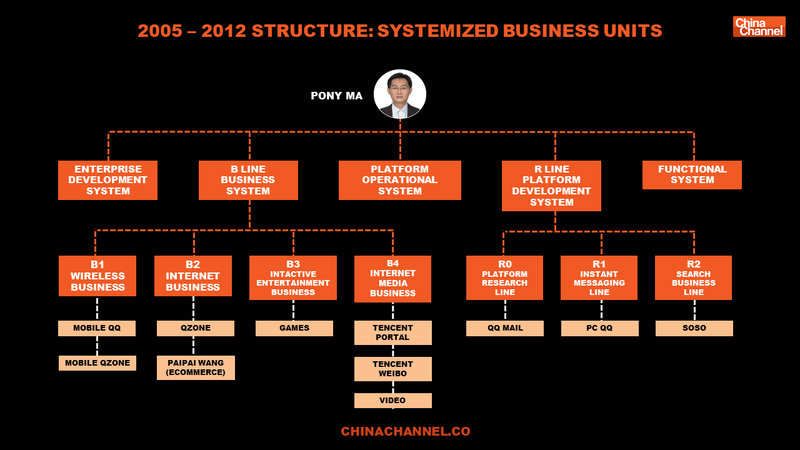 Pony Ma when he has given public talks over the past year, they have mostly been focusing on the areas of B2B business most often mentioned would be Tencent’s smart retail solutions. It seems that higher management has decided that the development of Tencent’s B2B solutions will decide the future potential of the company. B2C business has peaked as the number of mobile internet users has passed its rapid growth stage. User growth for most major internet companies has declined considerably. Yet when doing B2B internet business in China, Tencent will undoubtedly find themselves competing with their arch rival Alibaba and this competition will be tough. Alibaba, unlike Tencent, has B2B in their blood. From the early days, their company started out with the incredibly tough job of making sales of their internet services to factory owners who’d never heard of the web before. Persuading them of the merits for this new way of gaining clients without meeting them in person. “Many people said we only have ‘B2C’ in our DNA. B2B is not in our blood. I don’t believe that. I think that every evolutionary successful species holds characteristics that weren’t there at the beginning but were evolved over time.”- Martin Lau, Tencent Internal Staff Meeting 2017. 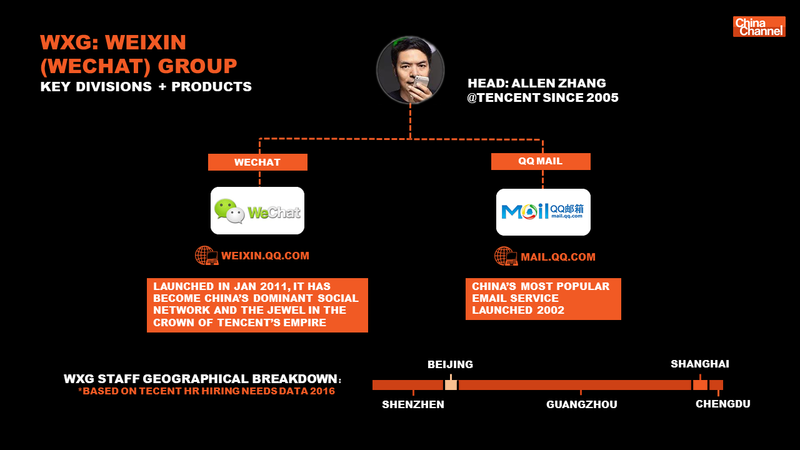 Tencent’s traditional strength throughout its 20 years of existence has always been in B2C. They have a proven understanding of how to monetize large user bases. They have access to the deep social graph of Chinese internet users and they are consistently able to produce products that Chinese consumers love to use. Apart from investment income, Tencent’s main profit model today is to accumulate new users, cultivate their usage habits over time, and make profits eventually through games, user fees, and advertising. This monetization could be said to be a long and indirect process. By contrast, the revenue earned from B2B businesses appears to be more direct and the clients are often stickier. Once the relationship is established, transactions will continue, and the income is more stable than B2C. Arguably the most important key area for Tencent to focus on in this new pivot to B2B is cloud services. 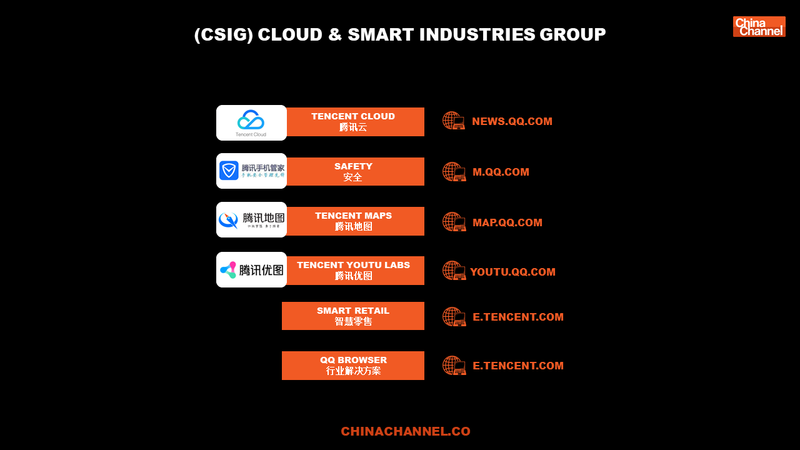 Tencent official statements regarding the restructuring highlighted the fact that Tencent Cloud now has more than 2,000 partners and more than 60 industry solutions. According to 36Kr (a respected local Chinese tech media), Tencent Cloud is currently on a hiring spree with positions in all major cities across China. 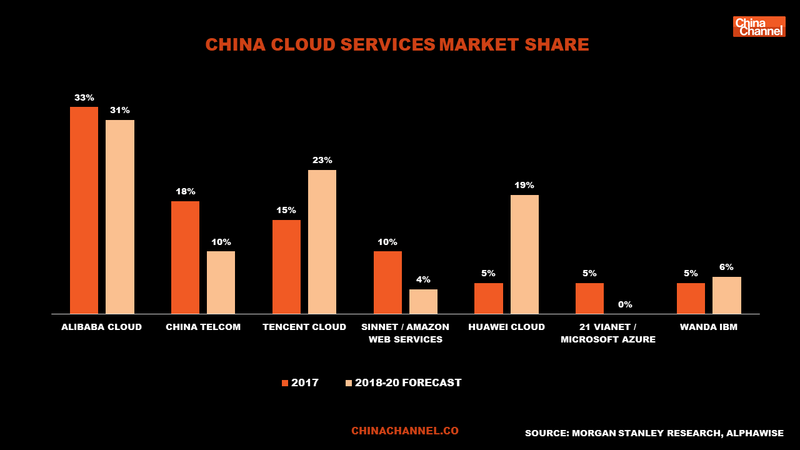 Yet when we look at the cloud industry as a whole in China we can see that they have plenty of ground to make up to catch the market leader AliCloud. Alibaba formed their independent Alicloud team in 2009, Tencent Cloud was started in 2010. 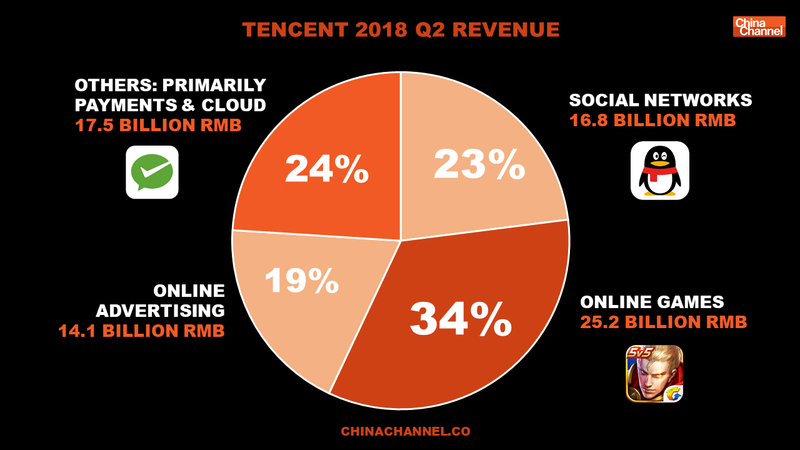 Revenue from cloud services is currently booked under the ‘Others’ segment in Tencent’s revenue reporting and from all indications, it makes up a small part of the segment currently dominated by payments revenue from WeChat Pay. If they are as serious as they say they are about this business then one day we can eventually expect Tencent to break out cloud into its own revenue segment during financial reporting. Personally, I feel it’s high time that they offered investors more insight into the rapidly growing “others” segment and clarify further the exact amount the payments business is also contributing to the bottom line. Certainly, we can expect some consolidation. I don’t think anyone would be surprised at all if Tencent Pictures and Tencent Penguin Pictures combined (they previously were in separate BGs). Personally, I’m still somewhat confused about the difference between the two. I was also a little surprised to see Tencent Esports being transferred into this new group, I get why they’ve shifted it over as technically Esports does fall under the “content”, but part of me expected them to have kept it under gaming (IEG) simply based on how closely related the two are. I think they make a very interesting point. Online content consumption habits come in waves and are usually shaped by the limits of data bandwidth and other emerging technologies of the time. Tencent was clearly taken off guard by Bytedance’s advanced application of AI algorithms to deliver personalized content recommendations to users, firstly with Toutiao (Daily Headline) and secondly with Douyin (TikTok). Bytedance has taken its advantage and leveraged it well into building out a mobile app entertainment ecosystem which has made them the darling of the Chinese internet in 2018. Yet this advantage will be eroded away over time as the competition catches up. Just as the trend of short video only became possible with the advent of ubiquitous 4G and low-cost data plans, a new opportunity for Tencent to gain back lost ground in the area of content will certainly open up with along with the era of 5G. Exactly how consumption habits will change and what the new killer formats/apps will be is not clear right now but we can be sure that the 5G technology will eventually bring with it huge changes to how we consume content online. Tencent is no doubt hoping history with will repeat itself. It’s well known that Tencent became heavily obsessed over competing with Sina Weibo during the “Weibo Wars” period of 2010. Yet by late 2011 Pony Ma proclaimed “The war with Weibo is over.” Tencent never actually won that war, instead, WeChat became a break out success and to some degree made the whole competition irrelevant. Another very important aspect of the changes announced which we must address in our analysis is the establishment of the central technology platform. As many commentators have pointed out Tencent’s customer data is scattered in various departments, and there is relatively little openness between teams. Tencent’s lack of data mastery has led to some disadvantages for the organization at the algorithm level. The establishment of the Tencent Technical Committee is designed to address this exact issue and break down the data silos. The central platform strategy seems to be following in the footsteps of Alibaba. In 2015, Ali made a similar architectural adjustment, proposing that data be pooled together across several of its key business units to form a central platform group. There is a question right now over the overlap of responsibilities between the Technology and Engineering Group (TEG) and the new central platform. TEG is Tencent’s internal technical support platform, providing the company with a full range of operational solutions and service support. None of these teams were merged together under this restructuring and there’s a legitimate question as to why that hasn’t taken place. AI research and data is not ideal to be too scattered, which will lead to areas of overlap and more importantly perhaps some key areas being missed altogether. The main thrust of the structural changes are to support Tencent’s strategic shift in focus towards the “Industrial Internet”. Looking back, it’s clear that Tencent has been moving in this direction for a considerable time, the restructuring is simply a reinforcement and confirmation the new direction. The challenges are obvious, a shift in company culture will need to take place and competitors, in particular, Alibaba, have a solid head start in key areas such as cloud. Still, they have some impressive resources to bring to bear in this battle. 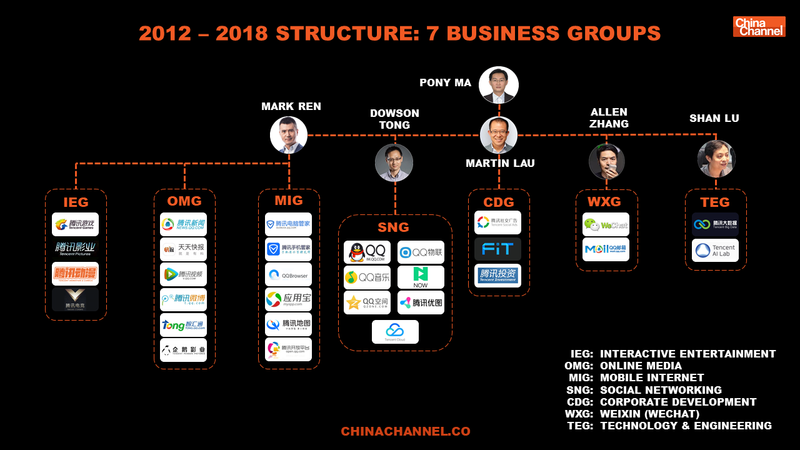 In particular, I see two spaces where Tencent can leverage its current advantages much further into making compelling offerings for the B2B sector which cannot be mimicked well by competitors, those being mini programs and enterprise messaging. I look forward to putting together an analysis of those two opportunities another day.